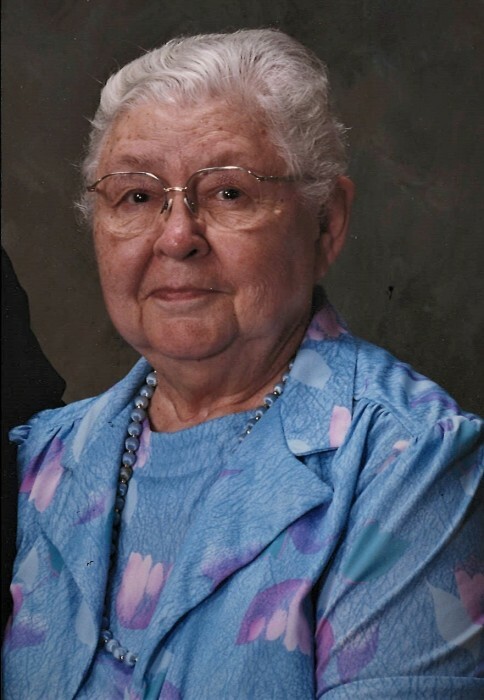 Gladys “Vontella” McEndollar, age 95, of Neoga, Illinois passed away at 8:10 a.m. on November 22, 2018, at Heartland Christian Village, Neoga, Illinois. Funeral will be held at 2:30 p.m. at C & A Pagel Funeral Home, St. Elmo, Illinois on Sunday, November 25, 2018. Reverend Terry Sapp will be officiating. Visitation will be held from 12:30 to 2:30 on Sunday November 25, 2018, at C & A Pagel Funeral Home, St. Elmo, Illinois. Vontella was born February 26, 1923, in Wheatland Township, Illinois, the daughter of John Fredrick “Fred” McMillan and Myrtle Gertrude Williams. She married William Kenneth McEndollar on December 21, 1939 at the 1st Christian Church, St. Elmo, Illinois. Kenny preceded her in death on February 12, 2006. Vontella was a charter member of Home Community Education and the 119 Club. She was an avid quilter and crafter. Vontella was a member of the Brownstown’s 1st Christian Church where she taught Sunday School, and was a director and teacher of Vacation Bible School. Memorials may go to the Sidener Cemetery or donor’s choice. She is survived by her daughter, Merna (Wayne) Manley, Windsor, Illinois; 7 Grandchildren; 11 Great-grandchildren; and 11 Great-great-grandchildren.